Environment advocates are calling for a two-pronged approach to address the nationwide problem on waste. Greenpeace Philippines and Break Free From Plastic Movement said a legislation banning single-use plastics should be passed as these are mostly thrown away afterwards — polluting the environment & increasing volume of waste for disposal. 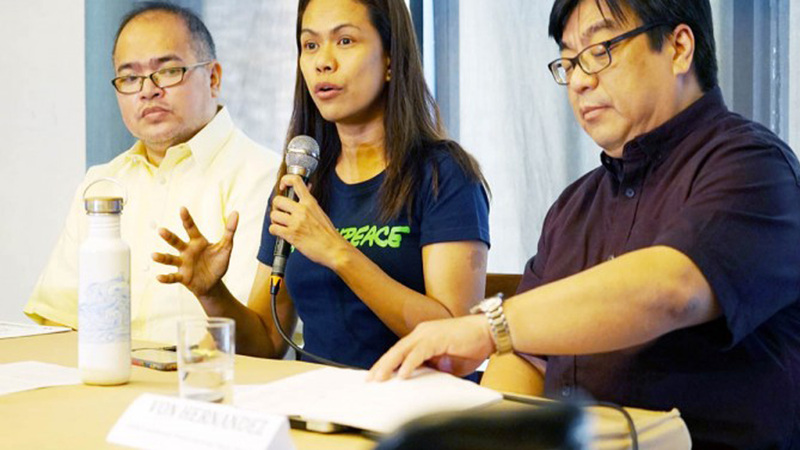 In a press conference in Quezon City Tuesday, Greenpeace campaigner Abigail Aguilar said corporations have funds to innovate. From production of single-use plastics, companies could shift to alternative packaging and product delivery systems. She said results of the third quarter 2018 Social Weather Stations survey, which indicated rising public awareness about the country’s waste problem, calls for the need for environment-friendly alternatives to disposable plastics. Product delivery systems like installing and operating refilling stations instead of packing goods in single-use plastics would help address the country’s waste problem, she added. The idea is not new as some stores refill the customers’ own reusable containers. “That old system can be brought back and mainstreamed – it’s the way to go,” she said. The same survey showed that seven out of 10 Filipinos will support electoral candidates who will ban establishments from using single-use plastics. It also showed that eight of 10 Filipinos will vote for candidates who will advocate the strict implementation of solid waste management laws. Results of the survey reflect the global trend favoring alternatives to single-use plastics. “Such results validate Filipinos’ clamor for addressing the waste problem,” Break Free From Plastic Movement coordinator Von Hernandez said. Hernandez debunked claims that many plastics can be recycled. “Most plastics aren’t recyclable – these disintegrate into microplastics instead and end up in the environment,” he said. He noted that microplastics are tiny plastic particles which animals can easily ingest thus, harmful to health.